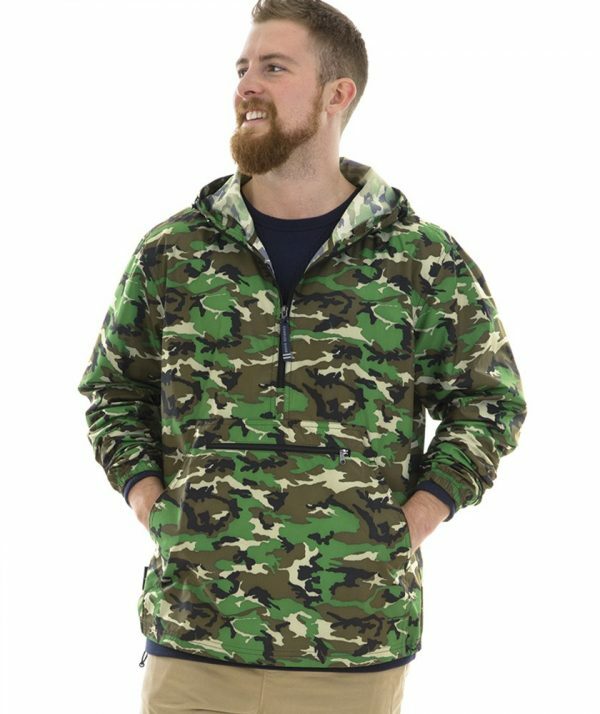 The Charles River Apparel Style 9904P Pack-N-Go Pullover is available in a Camo Print Sizes XS-3XL. SKU: CR-9904P Categories: Pullover Jackets, Outerwear Brands: Charles River Apparel. An excellent packable windbreaker pullover from Charles River Apparel. Ultra Lightweight, this pullover rapidly and simply packs into its own front pouch pocket and zips shut. Great for your golf bag, a jacket to travel with or an emergency jacket for your car. Wind and water-resistant. Elasticized cuffs. Adjustable shock cord drawstring at the hem helps seal out wind and rain. One of our best-selling styles just got a whole lot better. Made from a powder soft and feather –light Softex Polyester with a water-resistant finish. The Charles River Apparel Pack-N-Go Pullover is only available in Camo Print. Charles River Apparel 9904 Men's Pack-n-Go Pullover Jacket from Jonathan Javid on Vimeo.